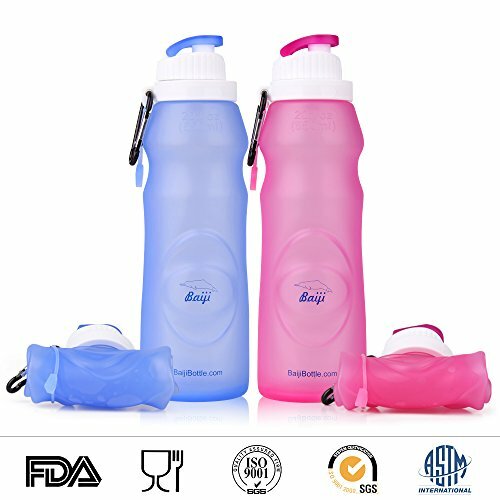 The baiji bottle silicone water bottle (set of 2) fun, functional, convenient, unique (and each purchase makes a difference) 2-pack of silicone water bottles by baiji bottle. - Each food grade silicone bottle is individually packed- two bottles, one red and one blue, are packed into a 2 bottle set and shipped directly from amazon to you.- Soft supple silicone is strong and stain, odor, and taste resistant- great gift for anyone who drinks water- since each bottle is individually wrapped, they can easily be used or given out in single units more benefits - foldable and rollable: Designed to stand upright when full and can be folded, rolled up, or laid flat when empty.- Carabiner: The included carabiner can be used to clip bottle to gear or to hold the bottle for storage.- Retainer strap: The retainer strap is made of the same silicone and can be used to hold the bottle in rolled position.- Washable: Dishwasher safe on the top dishwasher rack. Easy to wash by hand as well.- Freezing: Fill 1/2 to 2/3 full and stand upright in freezer. Once frozen, top off and enjoy a cool drink for hours- sharing: Baiji bottles are unique and fun to share. Why baiji? Our bottles are named to commemorate the baiji dolphin which was declared "functionally extinct" in 2007. While the baiji is gone, there are many dolphin species in need of help. So we have committed to donate 10% of all baiji bottle profits to dolphin rescue and protection programs.Current pricing is an introductory offer for amazon buyers, click the yellow "add to cart" button now to lock in the lowest possible price. If you have any questions about this product by Baiji Bottle, contact us by completing and submitting the form below. If you are looking for a specif part number, please include it with your message.